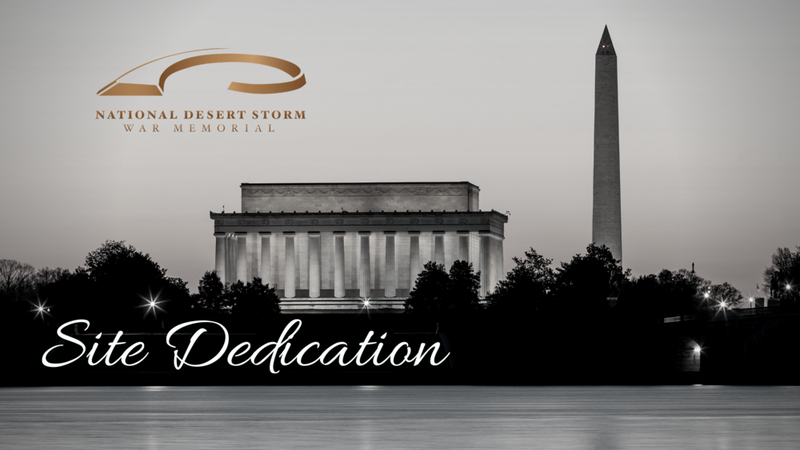 The National Desert Storm War Memorial Association is honored to announce the Official Site Dedication Ceremony for the National Desert Storm and Desert Shield Memorial! This Site Dedication Ceremony is not to be confused with the Groundbreaking Ceremony or the Dedication of the Memorial. These two additional events will be happening in the future. We will begin the seating process at 9 am. This is the SW corner of Constitution Avenue and 23rd Street NW in Washington D.C. The Ceremony will be held outside and will only be canceled if there is extreme weather that otherwise cripples the city of Washington D.C. Seating in chairs will be on a first come first served basis. We will begin the process of seating guests as early as 9 am. Guests are encouraged to use public transportation, taxi, Uber, Lyft, etc to get to the Ceremony as there is no public parking in close proximity to the Site. Rooms at this rate are available from [checking in on] Monday, Feb 25, 2019, through [checking out on] Thursday, Feb 28, 2019. Holiday Inn Rosslyn, 1900 North Fort Myer Drive, Arlington, VA 22209. All reservations must be made by January 28, 2019. Any reservations made after that date or after the block has been filled will be subject to rates based on the hotel's availability. Rate does not include breakfast or parking. Guests have until 24 hours prior to arrival day to cancel their room reservation free of penalty. Check-in time is 3 pm and check out time is noon. Garage parking is available on a first come first served basis at a fee of $10.00 per car per night. Complimentary Wi-Fi, access to indoor pool, fitness center and business center is included. We are very excited to announce this news as we continue to progress in the journey to build the National Desert Storm and Desert Shield Memorial in Washington D.C.
We look forward to seeing you on February 26th!